Thank you, San Diego Family Magazine readers, fans and followers for answering the call for your favorite family hangouts and hot spots around the county and beyond. Here you’ll find the complete list of 2018 Best of Family Fun winners and top picks in each category. Use it as a bucket list for year-round entertainment! STEM comes to life at the Fleet Science Center where rotating exhibits keep kids entertained and engaged with the world around them. Also in Balboa Park, the San Diego Air & Space Museum teaches little aviators and astronauts about the science of flight. Plus, don’t miss the annual San Diego Festival of Science and Engineering—always in March. San Diego is bustling with free family-friendly activities and events all year long. There’s something for everyone whether it’s spending a day playing in the surf and sand at one of San Diego’s gorgeous beaches, attending Summer Movies in the Park or exploring one of Balboa Park’s museums on Residents Free Tuesdays. Even supermoms need an occasional night out on the town. Grab your girlfriends and check out The Rose Wine Bar in South Park for happy hour or dinner and drinks; then head over to Belly Up Tavern in Solana Beach for live music and dancing, or catch a movie at The Lot, complete with reclining chairs and snacks delivered to your seat. Grab your paintbrushes and head to The New Children’s Museum downtown where little artists are free to cultivate their creative side with interactive art installations and hands-on activities. 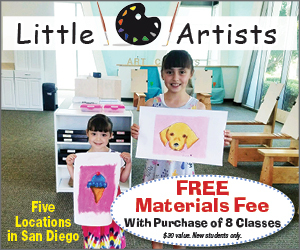 For more inspiration, spend an afternoon exploring the San Diego Children’s Discovery Museum in Escondido or creating a masterpiece at AR Workshop. Do you ever have a hankering for your favorite food but don’t feel like getting out of the car? You’re in luck! Panera Bread in El Cajon, Otay Ranch in Chula Vista, and Carmel Mountain Ranch locations offer a drive-thru for on-the-go customers looking for a healthier option, while popular burger chains The Habit (Mira Mesa) and Sonic Drive-In are serving up burgers and shakes right to your car window. Tired of the traditional dinner-and-a-movie date night? Try something new like a romantic gondola ride through the Coronado Cays in San Diego Bay, dinner and drinks at The Prado in Balboa Park, or an indulgent meal and ocean view at Jake’s Del Mar. Planning a party for little ones is a breeze with these family favorites that will make your celebration fun filled and stress free. In first place, FUNbelievable Play offers a variety of party packages for celebrations big and small. In second place is Kid Ventures followed by Gymboree Play & Music. Let’s get this party started! Clearly there are tons of people who already know the awesomeness of Flying Flags RV Resort & Campground (up the coast in Buellton) because they won best family resort! Glamping in safari tents with bunk beds for kids, outdoor fire pits, swimming, bocce ball—what’s not to love? Other family favorite getaways include the Disneyland Resort and Great Wolf Lodge, both in Anaheim. Corvette Diner reigns as best restaurant for kids: 50s music, themed rooms, an arcade and servers who decorate your hair with straws. I mean, come on! But don’t miss John’s Incredible Pizza in National City—arcade games, rides and an all-you-can-eat buffet. Landon’s Gourmet Kitchen in San Marcos helps parents have a much-needed date with onsite childcare. Attractions featuring The Walking Dead, Fast & Furious and The Wizarding World of Harry Potter make Universal Studios Hollywood the favorite destination for families with teens. Top picks include Belmont Park’s beachfront amusement park and K-1 Speed‘s indoor go-kart racing. Well known for it’s extreme coasters and thrilling rides, Six Flags Magic Mountain in Valencia tops the list for best activity for thrill-seekers. Additional favorites include soaring over rhinos at the Safari Park’s Flightline Safari (zipline), and the exhilarating freefall experience of indoor skydiving at iFly. It’s no wonder local families flock to Balboa Park’s 1,200 sprawling acres for photos. Gorgeous gardens, stunning architecture, and a variety of backdrops make it ideal for many styles and preferences. Other photo hotspots include La Jolla Cove and San Diego beaches, such as the ones in world-famous Coronado. What’s better than dressing like your favorite princess or Disney character and seeing them perform live in Disney on Ice? Not much when you’re a kid! Other fabulous live performances for families include the whimsical holiday classic Dr. Seuss’s How the Grinch Stole Christmas at The Old Globe and concerts by the wildly popular band, Hullabaloo. Great Wolf Lodge in Orange County is an epic spot for indoor play with a giant water park, character appearances, miniature golf, a mini bowling alley and so much more! Want to stick closer to San Diego? There’s tons of fun to be had at FUNbelievable in Lakeside and Altitude Trampoline Park in Vista. Three words: Beachfront amusement park. It’s not rocket science, but it is a BLAST! Belmont Park reigns as a San Diego fave, featuring the historic Giant Dipper Roller Coaster, midway games, laser tag, mini golf, a newly updated two-level sky ropes course and so much more. Top picks in this category include Dave & Buster’s and Boomers. When it comes to day trip destinations, San Diegans have a lot to choose from. Topping the list is a fun-filled day of character encounters and rides at the happiest place on earth, Disneyland Resort. Always a local favorite, a day trip to historic Julian to pan for gold or pick apples is a must for many families, or plan a fantastic adventure at Balboa Park. Let the kids run wild at Altitude Trampoline Park, Vista’s new favorite party spot, featuring wall-to-wall trampolines, Extreme Dodgeball and the Battle Beam. San Diego families also love hosting parties at FUNbelievable in Lakeside and Corvette Diner in Point Loma. Spend a day exploring San Diego’s world-class museums and learning something new. At the top of everyone’s list is The New Children’s Museum downtown, where kids are free to create new worlds through imaginative play and hands-on activities. Make scientific discoveries at the Fleet Science Center and be sure to hop aboard the historic USS Midway, a real aircraft carrier that doubles as a floating maritime museum. Vegan eaters and health-conscious foodies rejoice! San Diego is home to dozens of healthy food establishments with a flair for flavor. Stop by Veggie Grill for delicious dishes such as the Bombay Bowl and the “crab” cake sandwich, visit Native Foods Café for vegan sandwiches, salads and tacos or channel your inner hippy at Flower Child for meatless options such as the Thai Dye Rap and Mother Earth Bowl. San Diego has no shortage of natural spaces to explore and relax with the family. Spend an afternoon enjoying the beautiful ocean views at Torrey Pines State Natural Reserve, wander the scenic trails at Mission Trails Regional Park or play in the tide pools at Cabrillo National Monument. Whatever you choose, a wonderful adventure awaits! Some of San Diego’s favorite hidden gems are hiding in plain sight! Take to the sky and you’ll see that the Coronado Sand Dunes actually line up to spell out the word “Coronado.” Other local favorites include the seven bridges walk through Balboa Park and it’s surrounding communities as well as Barrio Logan, a neighborhood known for Chicano Park and delicious Mexican eats. Watch a cheetah run up to 70 miles per hour at the San Diego Zoo Safari Park or meet an adorable animal ambassador like Xena, a two-toed sloth, at the San Diego Zoo. Looking for an underwater animal adventure? Head to SeaWorld where visitors can swim with the dolphins and even feed a Beluga whale. Don’t let the funny name fool you, Hash House A Go Go takes breakfast to the next level with outrageously large portions of Midwest-inspired dishes like Sage Fried Chicken & Waffles and Biscuits & Gravy. Other San Diego breakfast favorites include The Mission with unique offerings like the Soy Chorizo Burrito, and Breakfast Republic, best known for its French Toast Sampler. San Diego’s favorite ice cream sandwich spot, The Baked Bear, takes number one for Best Frozen Treat. Choose from freshly baked brownies, donuts or warm cookies for your sandwich (or mix and match). Runners-up include Hammonds’s Gourmet Ice Cream, known for flights of mini ice cream cones, and Portland-based newcomer Salt & Straw. It’s no secret that learning and playing go hand in hand. At the Fleet Science Center, budding scientists explore 100 interactive exhibits covering topics from outer space to the human body. At the Birch Aquarium kids learn about marine life with hands-on interactions at the touch pool, while at the Natural History Museum little archeologists discover real Mastodon bones from the Ice Age! A favorite of locals and visitors alike, Corvette Diner specializes in traditional diner fare like old-fashioned ice cream shakes and melt-in-your-mouth burgers. In second place, The Old Spaghetti Factory offers unusual kid-friendly treats like Cotton Candy Limeade and a variety of Italian cream sodas. Also check out Lazy Dog Restaurant & Bar for build-your-own pizzas and ice cream sundaes. Do you ever have a hankering for your favorite food but don’t feel like getting out of the car? You’re in luck! Panera Bread in La Mesa and El Cajon offer a drive-thru for on-the-go customers looking for a healthier option, while popular burger chains The Habit (Mira Mesa) and Sonic Drive-In are serving up burgers and shakes right to your car window. Grab your swimsuits and boogie boards and head to one of Southern California’s various beaches and water parks. Rent a kayak or take a surf lesson at La Jolla Shores, enjoy the white sandy beach at Coronado or opt for an indoor water adventure at Great Wolf Lodge in Orange County. San Diego’s sunny weather and stunning coastline attract visitors from San Francisco to Tokyo. But what do tourists look forward to when they get here? It’s no surprise that the world-famous San Diego Zoo was voted our #1 tourist destination followed by beautiful Balboa Park and the USS Midway Museum.